You should have your 12-digit adhaar card number handy and the mobile number registered for OTP verification. If you do not have your mobile number, your adhaar card can only be corrected by post, otherwise aadhar online correction card. 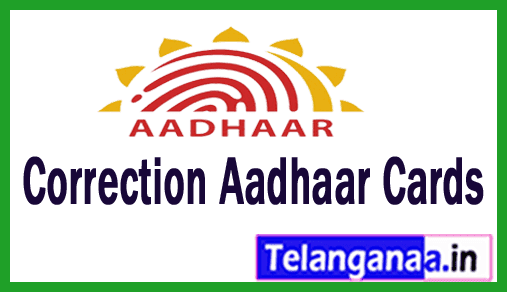 You must visit the following link to correct your adhar card - https://resident.uidai.net.in/update-data After the visit, click update data. After that, click on "Update Aadhaar Data". A page will open, asking for your Aadhar number. Now, for aadhar card correction, enter your AADHAR 12-digit card number and enter the captcha in the text verification area. Click Send OTP. Enter the OTP verification code received on your mobile phone number and correct the fields you want to correct in your aadhaar card. On the update page, you must check / uncheck the field you want to correct and click on "Submit". A new page will appear, On this page you will have to enter the data you want to be corrected. Now click the "Update Data Request" button. After that you wll be taken to a page where you will need to check the data you entered to be corrected. After rechecking, just click on the "MODIFY" button. After clicking the "MODIFY" button, you arrive at a page where you must attest your proof of document, it can be any govt. Proof such as driving license etc. The data on the proof must match the values with the data you have given to be corrected in your aadhaar card and also that they must be self-signed (attested) It can be in any form , Such as img, gif or PDF. You can get your proof by cam scanner app. Now, finally, you must select any agency adhaar card from where you want your data to process. You can select the voucher by seeing their previous evaluations / work. Let us know in the comments below if you have any other questions for aadhar correction card. Do not forget to share this guide to help others.